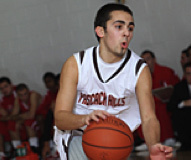 Pascack Hills star and former Hoop Dreamer Cole Dorfman scored his 1,000th point and we couldn’t be prouder. Cole, now a Senior, started classes with Billy in 6th grade and played on the very first Hoop Dreamz AAU team back in 2006! We wish him the best of luck as his team advances in the state tournament.